Anyway, the double cherry blossoms are in bloom, I heard these are called Yaezakura. These are more pinkish and fuller than the cherry blossoms that bloomed earlier in the month. Most have several clusters on a branch which weighs the branch down a bit. Our weather is still cold. Some days we've had sun but most days we've had rain and blustery winds. The plants on my lanai aren't too happy, the only blooms we had were of two tulips and the cyclamen that blooms without fail every year. One plant that has been doing well is the cilantro I planted a couple of weeks ago. Can't wait to start using it in salsa or banh mi. 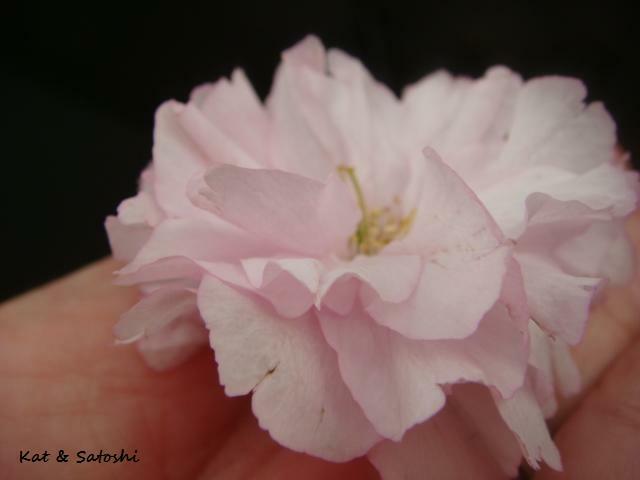 Satoshi's at work today, hope your weekend is going well. I have written before about adding grains to my rice when I cook it...here and here. 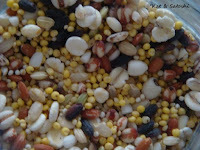 In the past, some of these grain mixes had grains from other countries. 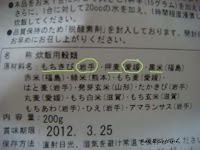 But at the supermarket I recently found one that is all "Made in Japan". 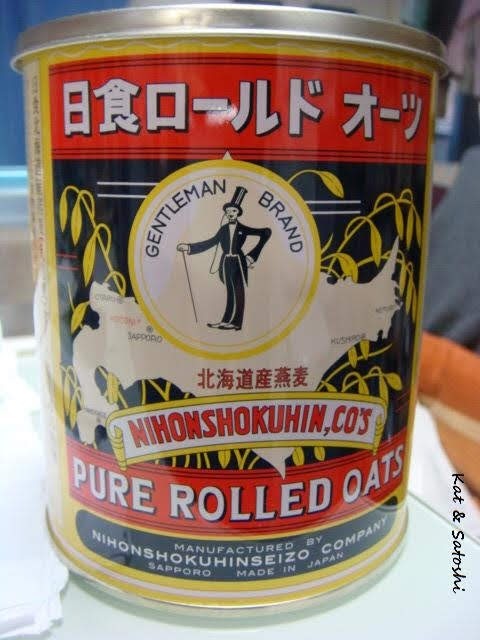 The word for "made in Japan" is "koku-san", literally "grown/made in this country". 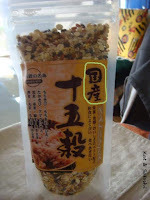 mochikibi (glutenous millet from Iwate), oshimugi (pressed barley from Ehime), kuromai (black rice from Fukushima), akamai (red rice from Fukushima), aomai (green rice from Kumamoto), mochimugi (glutenous barley from Ehime), hatomugi (adlay from Iwate), hatsuga-genmai (germinated brown rice from Yamagata), takakibi (sorghum bicolor from Iwate), marumugi (pearl barley from Ehime), mochihakumai (glutenous white rice from Shiga), mochigenmai (glutenous brown rice from Shiga), mochiawa (glutenous millet from Iwate), hie (japanese millet from Iwate), amaranth (from Iwate)...whew! I used to measure a tablespoon or two of grains before cooking my rice, but now I just sprinkle some into the unwashed rice and as I wash the rice, I run everything through a really fine sieve, so as not to loose the millet. Most mixes say to add more water, but I don't because I usually set my rice cooker the night before, so it has lots of time to soak and I like the chewiness and firmness of the rice. Today is Showa no Hi (Showa Day) It used to be called Tenno Tanjoobi (Emperor Hirohito's Birthday) but after he died, it was then changed to Showa no Hi. 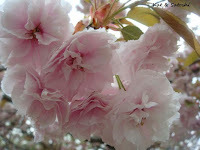 It is also the start of Golden Week...have a nice weekend! 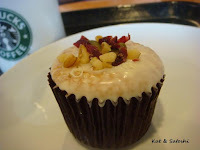 From their petite series...a fruit cupcake. A mini yellow cupcake filled with spice cake. The frosting or glaze was quite hard and sweet, it was topped with dried fruits and nuts. Delicious but I think they had noted it was 200-something calories?? eep! 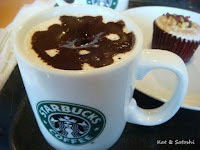 I also tried their cocoa cappuccino...a cappuccino topped with chocolate sauce. 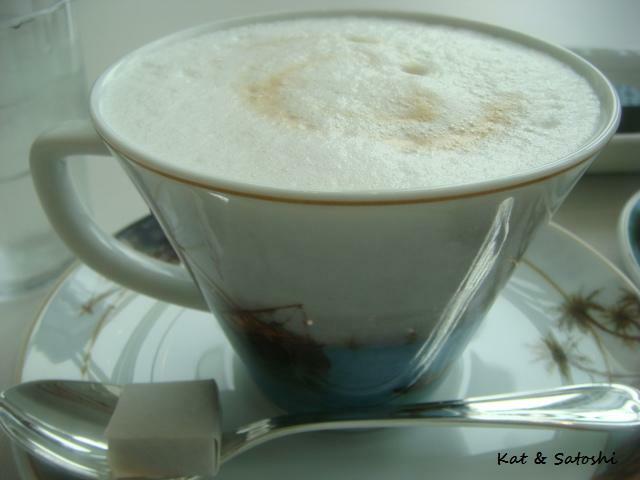 Meh, stick to the cappuccino or cocoa separately. 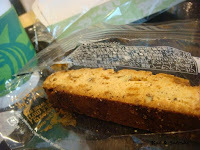 Caramel pecan biscotti...this when dipped into coffee...melts! Good but you gotta eat it fast or be prepared for it to crumble between your fingers or have some fall into your coffee. 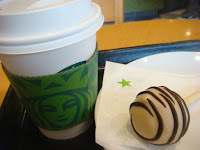 Tiramisu cake pop...this was more creamy than the first cake pop I tried. A coffee cream filling with bits of chocolate that were shaped like coffee beans. Super sweet, definitely nice with black coffee. This was sweet also, but in the middle was a tart strawberry gelee to balance things out. 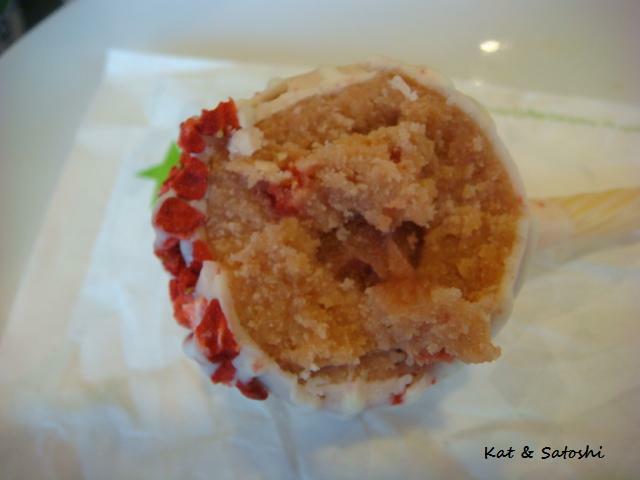 Also on the outside freeze-dried strawberry bits. A lot of different items, like I've said before, very hit and miss. 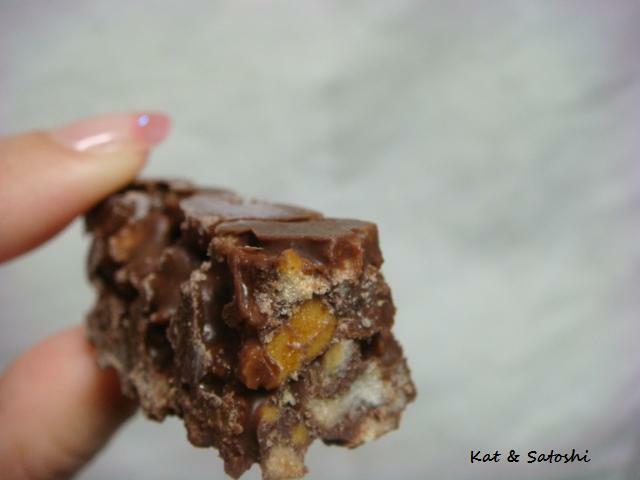 This past Monday was another Twitter Food Party. This month's theme was chocolate. 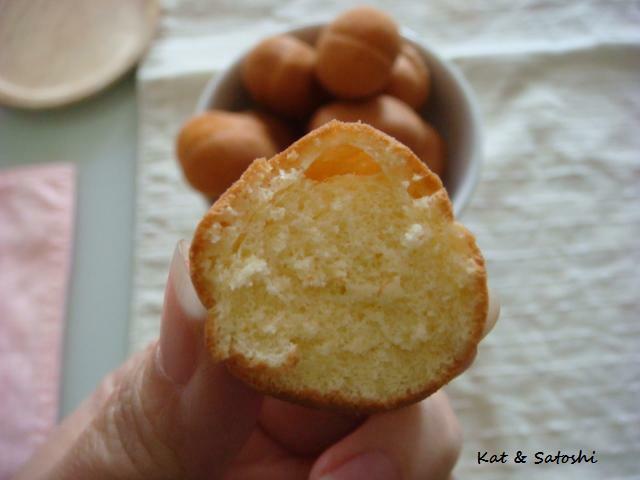 I hadn't participated in awhile and happened to make these muffins so I "brought" them to the party. I made plain muffins and added a square of Ghiradelli Dark & Raspberry chocolate to each. 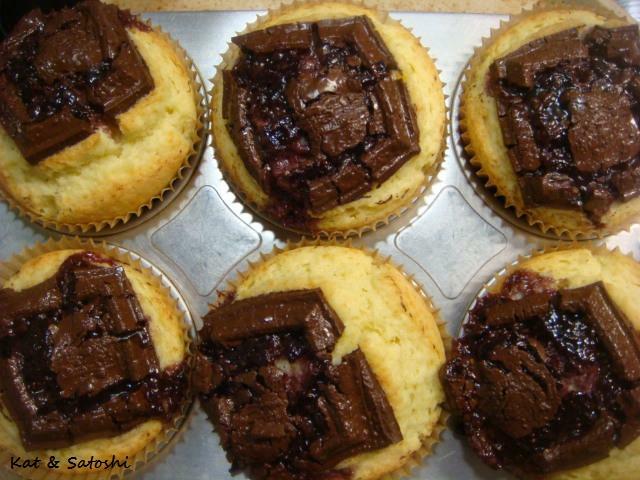 While the muffins baked, the raspberry oozed out and the chocolate melted. 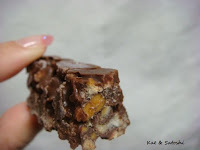 They look kind of ugly but taste really nice. I wonder what next month's ingredient will be? In Japan, this dish is called "roll cabbage". 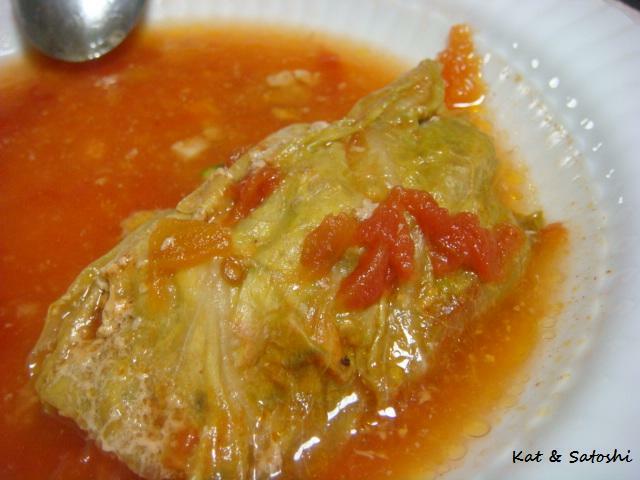 In Hawaii, it is called "stuffed cabbage". Since spring cabbage is in season now, I made this for dinner the other night. Only problem was that I only had 1/4 a head of cabbage, making for weird pieces of cabbage to "stuff". I washed the cabbage, then nuked it for a minute and a half. I "rolled" the filling into the pieces of cabbage that I could and ended up with 8 "rolls". I say "rolls" because the pieces of cabbage weren't large enough to totally wrap the filling properly. Then I put them in a frying pan with the water & consomme cube. When the liquid came to a boil, I skimmed off the scum and added the tablespoon of canned diced tomatoes, then skimmed more scum off. I let it cook on medium for a total of 15 minutes with a lid on the pan. Halfway through the 15 minutes, I turned them over carefully with tongs. When the 15 minutes were up, I left the lid on and turned off the heat. I served this with rice on the side. This was delicious and perfect for the weird cold weather we've been having the past couple of days. With the other 4 rolls, I've got enough for another dinner...woot! What have you been having for dinner lately? Have you ever had castella? 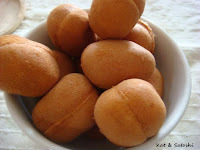 It is an eggy cake that comes from Portugal, I think the Portuguese name for this is Pao de Castela. Anyway, whenever there are festivals here you can see vendors selling baby castella, these are castella baked in miniature molds. Sometimes they are in the shape of cartoon characters, like Doraemon. Most times they are just cylindrical in shape. Yesterday as we were leaving the grocery store, this vendor caught our eye. 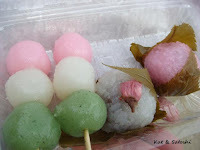 He was selling "holland-yaki" and when we passed by, he was quickly flipping them out of the mold with a toothpick. Satoshi and I looked at each other and turned back to buy some. These sweets were being sold in different amounts and we bought the smallest, 18 for 525 yen (about US$5.25). After he gave us 2 to sample, the vendor said he also put a little extra into our bag. When we got home, we had them with coffee, he actually gave us 4 extra (I counted...a total of 6 when you include the samples). 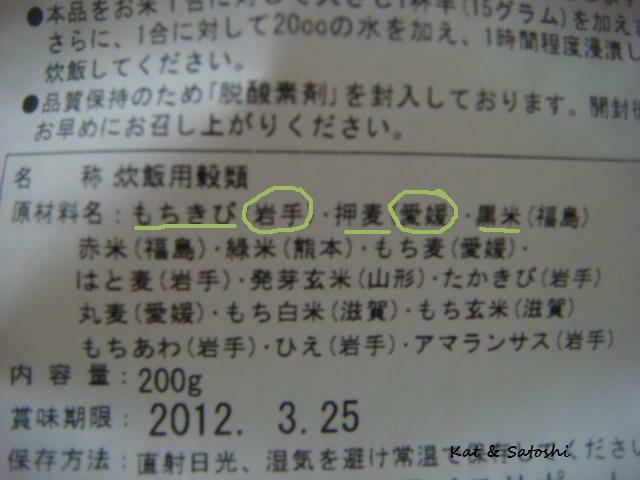 I looked at the back of the package and one of the ingredients is white miso, though you can't taste it at all. 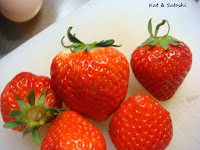 Not sure why these are called Holland-yaki but these were delicious, so easy to eat them in one sitting...which we did. 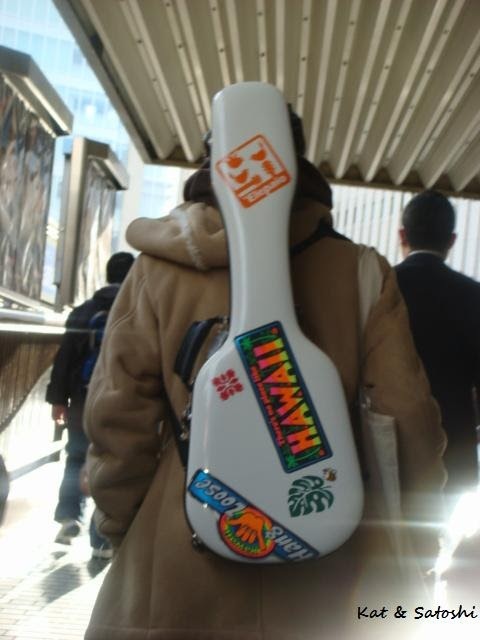 I chased after him, and it turned out it wasn't, but I got a pretty good shot of his ukulele case. Hope you're having a nice Easter Sunday. 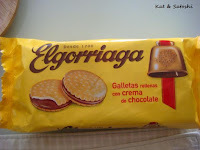 Found this at the train station's convenience store...Elogorriaga's Galletas from Spain. In Spanish, galletas are cookies...these are filled with a chocolate cream. 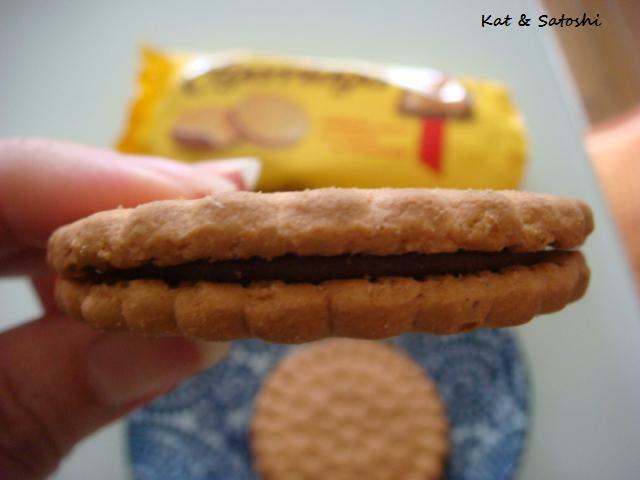 The taste of the cookies without the cream, reminded me of a creme cracker that we have in Hawaii. Best part was that these were on sale for 105 yen (about U$1.05)...4 in a package, a great little snack. I was reminded by the little news area on the Yahoo page that today is Earth Day. When I think of Earth Day, somehow I think of the color "green". 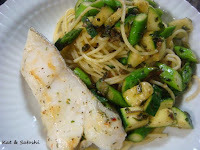 Tara (codfish) marinated in basil oil served with zucchini & asparagus sauteed in pesto and served over some pasta. The tara was sold already marinated...98 yen a piece (about US$.98), more than basil oil, this tasted like Italian dressing. Our weather has turned back to cold...the past couple of days we had rain and the temps went down to like 9C (48F)?! It is Friday here, hope your weekend is a nice one! Last month on a weekday, when Satoshi had the day off, we checked out Oyaji Curry. A tiny shop with 10 seats run by a guy and his father. "Oyaji" is the slang for "Dad", kinda like calling your dad "Pops" but literally means "old man". Anyway, I found this place by walking in the area once and made note that we should check it out. 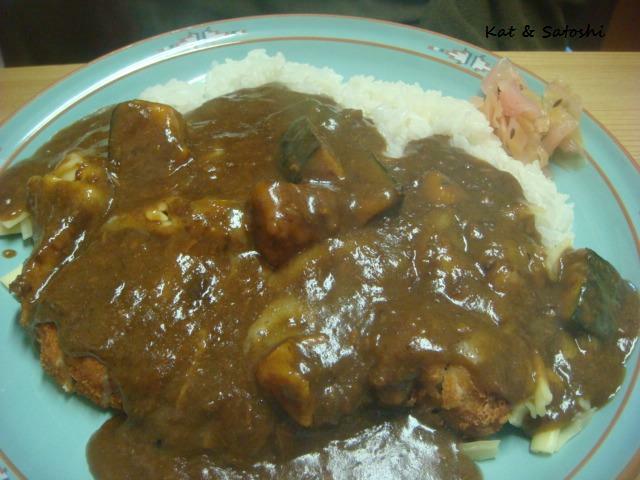 They make their curry from scratch and you add toppings to it. 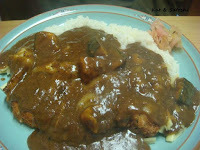 Satoshi chose the Oyaji Special, this had some katsu (cutlet), cheese, eggplant and the curry over rice...This was huge! 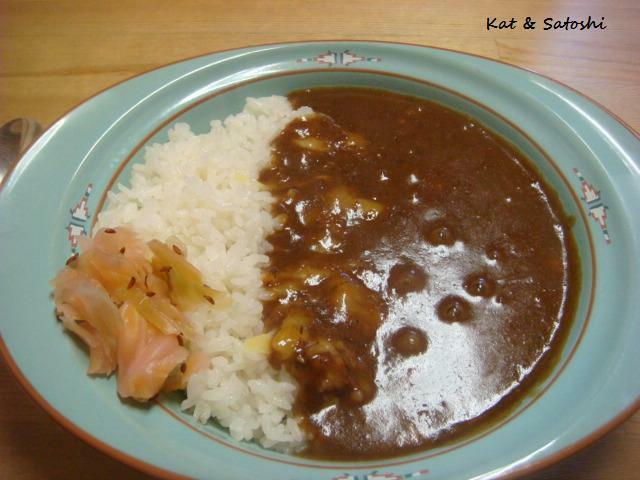 Their curry is delicious, with a slight heat that slowly works it way. You can also choose the level of heat that you want. Both of us went with mild. If you eat there on a weekday, they give you a small salad too. I loved the homemade pickles that came with the curry really puckery. I would definitely eat here again when we're in the area. Last month, I think I mentioned that Osaka is selling bottled tap water, well, I found a bottle at a convenience store in Osaka city when I went to French class yesterday. We live outside Osaka city, so they aren't selling it in our area. 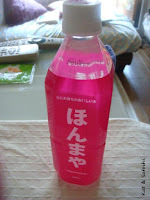 It was 100 yen (about US$1) for a bottle. Its name is "Honmaya". On one side of the bottle it says in English that "Honmaya is a word used by Osakans to express astonishment and surprise. Osaka Municipal Waterworks Bureau is proud to present their bottled water. Using an advanced water purification system with ozone and activated carbon, the quality of water in Osaka has reached excellency with a mild, sweet taste. 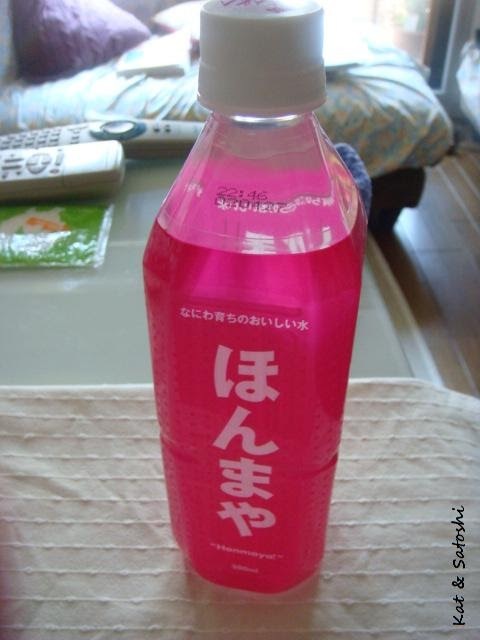 Drink it, taste it and you too will exclaim, "Honmaya"!" My interpretation of the phrase "honmaya" is that it is the same as how we use "for real" in Hawaii. Am happy that their "english" on the side of the bottle was decent, sometimes you wonder what dictionary or spell check they use for things. Dunno about a sweet mild taste though, it tastes...well, like water. I'm glad they filtered it though because when it comes straight out of the tap it does sometimes tend to have a slight odor (ew! 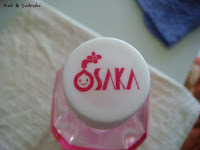 )...though I do love how they make it cute with the faucet picture and pink wrapping. Plus, I heard there is a shortage of the plastic caps for the bottles. The manufacturer is asking different beverage companies to order "white caps" instead of caps with logos or colors, the reason? With the planned blackouts, it takes more time and fuel (electricity) to make them different colors or with logos because they have to start and stop the machines to meet the different orders...I guess in the end, if you can drink water from your tap, please do. Some sweets from Shogetsudo, these were eaten the day after the earthquake when we needed some kibun tenkan. 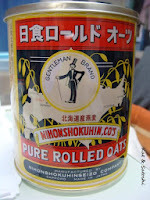 Found rolled oats here, made by Nisshoku, same company I found these oats by. White day (March 14) came and went. 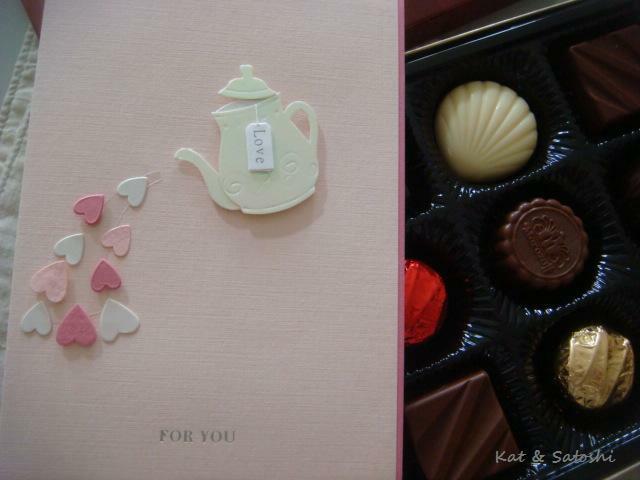 Satoshi was nice and got me a box of chocolates and this cute card. I ate the dark chocolates and shared with him the white and milk chocolates. Love this tuna sandwich from Cascade. 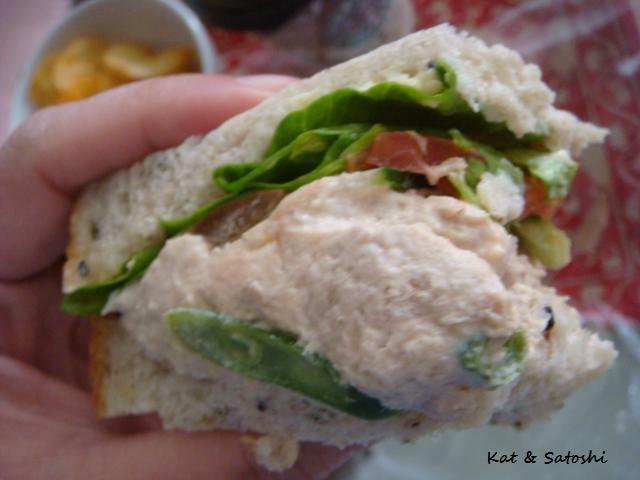 There is so much filling than bread (a good thing) and they also put veggies like green beans & corn in there too. It had been 5 years since I had eaten Esola's cheesecake, in that time, they have closed a shop and now have other "flavors". We tried their matcha and their strawberry. 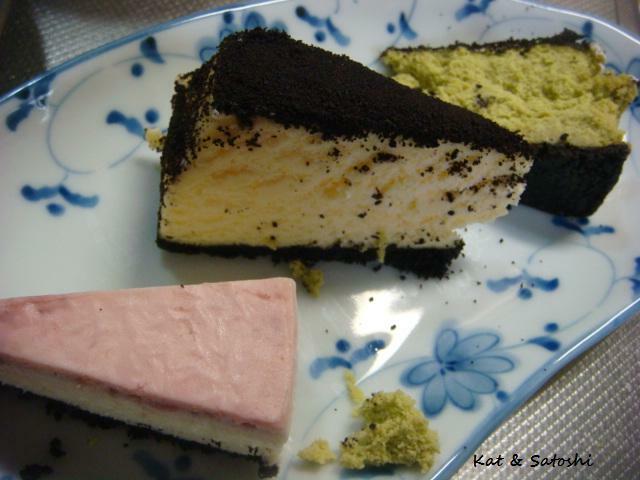 All were delicious, though we agree that the original is the best. 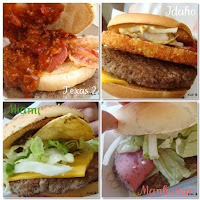 Not really liking the "American burgers" from McDs. Satoshi tried them all, I just took a bite from each. Texas2 and Miami were my favs while Satoshi liked Idaho, Texas & Miami. Sanuki Hime (Sanuki Princess) is the name of a strawberry from Kagawa Prefecture. Sanuki is the old name for this area. 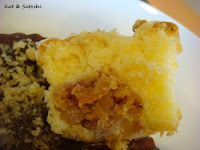 This one was a bit tart but a nice match with bananas and some yogurt for breakfast. 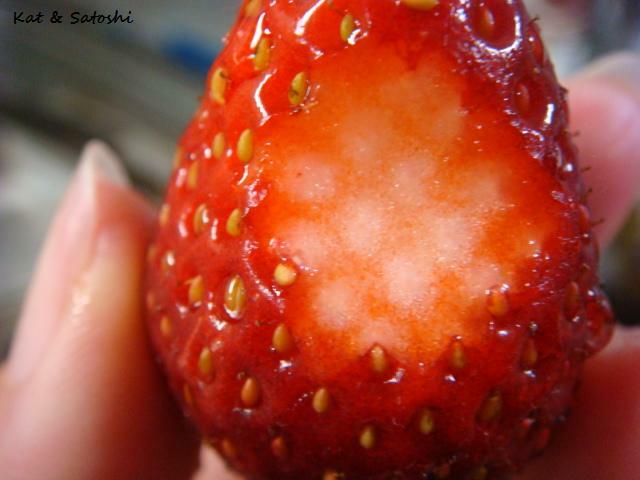 Love how when you slice off the bruised area of a strawberry it looks like polka dots. For White Day, I bought myself some teas (and salted butter caramels). From Harney & Sons, I got their tag-along tins, these only had 5 tea bags each. 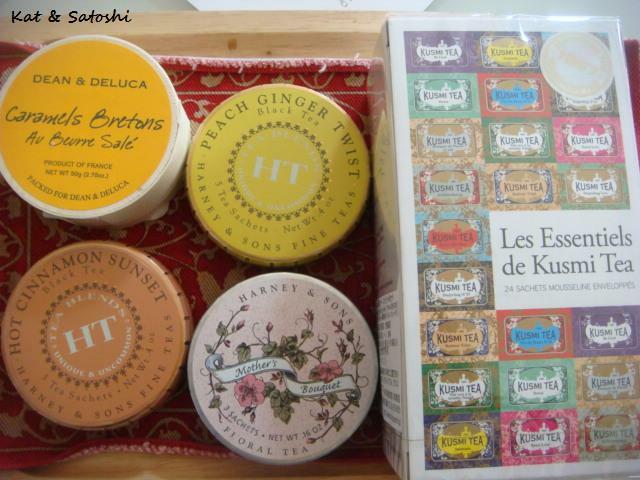 I also got the assorted Kusmi Tea bags. 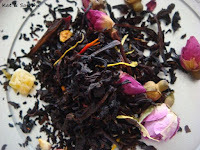 If you click on the photo, you can read all the descriptions for each tea. All are now gone, but all were very delicious! I loved the tea tags from the Kusmi tea, laminated and sewn onto the muslin tea bag. 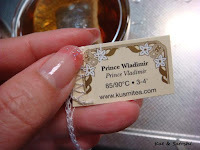 Be sure to hold the tea tag above your tea cup when steeping though or you will find a tea puddle on your counter. 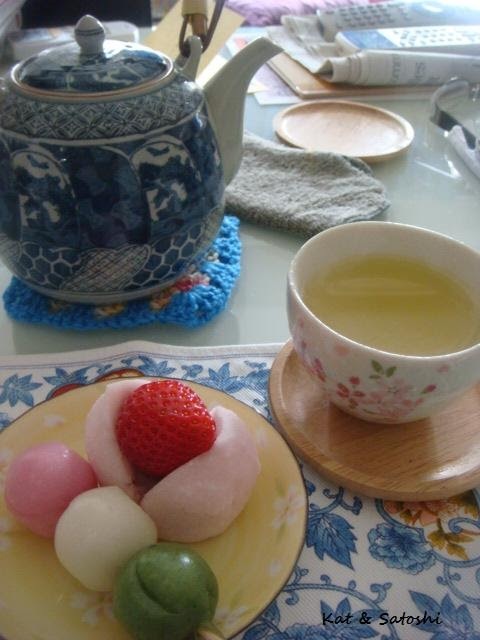 We had our own little tea party at home one afternoon, with some sweets from Chikujian and a pot of green tea. UPDATE: Because of the disaster, and radiation issues, tourism is really down (among other things), I think they were saying 50% down?? It will take many many months for these devastated areas to re-build but each of us can do our share to help. 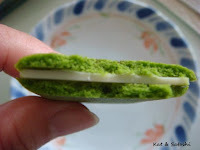 We are trying to eat locally, trying to buy things "made in Japan" and trying to travel to areas that aren't affected. What are you liking, disliking? While waiting for Satoshi to finish his class, I went back to Cacao Sampaka since I had a 10% off coupon that needed to be used here. 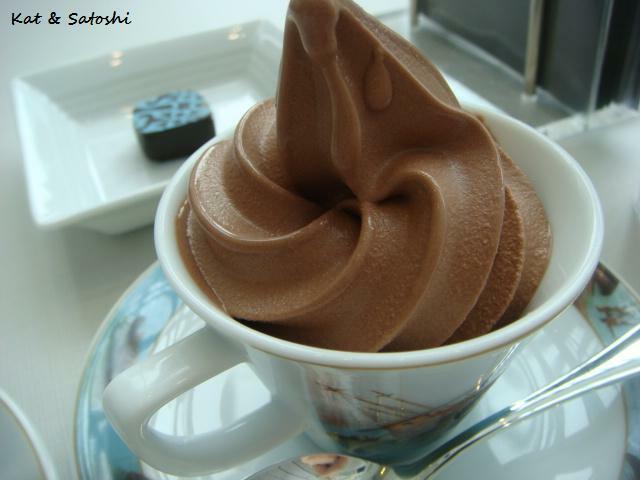 This was served in a demi-tasse cup. This size was perfect...rich, delicious. 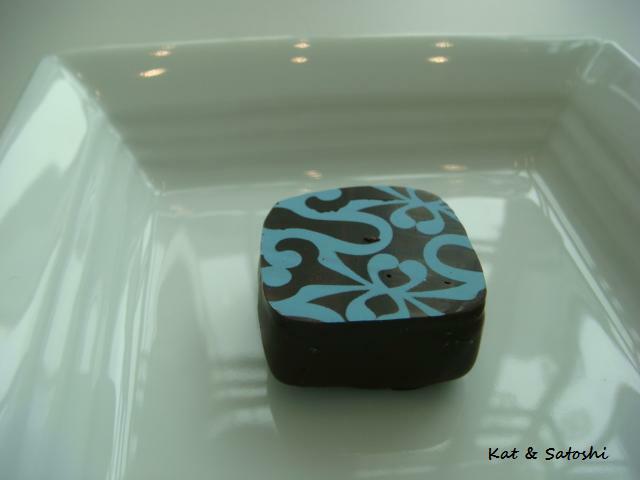 When ordering gelats, you also receive a bon-bon. This was called Llima. 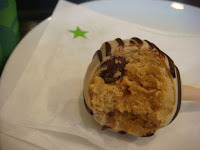 The in-house "chocolate specialist" told me that it was a lychee flavor with dark chocolate, but when I took a bite of it, it was sour, nothing like lychee. As I was leaving, I went to look at their showcase. 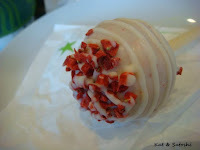 The bon-bon which I had tried said that it was filled with lime! not lychee. It also mentioned that this was a milk chocolate ganache with a dark chocolate coating. After searching their site, I found out this was from their No.6 collection Fruites i melmelades de fruita (Fruit & Fruit Jam). In the past, I've tried bon-bons from their other collections, in the days before they brought a store to Japan. This was good, just surprised me because the specialist said lychee. I'm glad I had a little discount on these items. Not sure if I would go back though. Yesterday, Satoshi had his German language class, so we headed to Umeda for lunch. 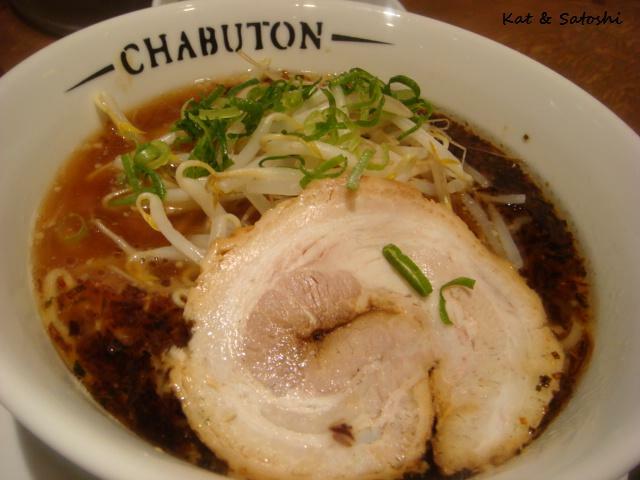 We decided to try Chabuton since we had just seen a television program on it. The owner has won several competitions and is very particular about the shape of his bowls, noodles and soups. 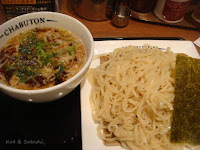 I chose the zaru tsukemen...750 yen (about US$7.50) a shoyu based soup with menma (pickled bamboo shoots), bean sprouts, green onions & bits of char siu. The noodles are served cold and are flat, most ramen noodles are round. 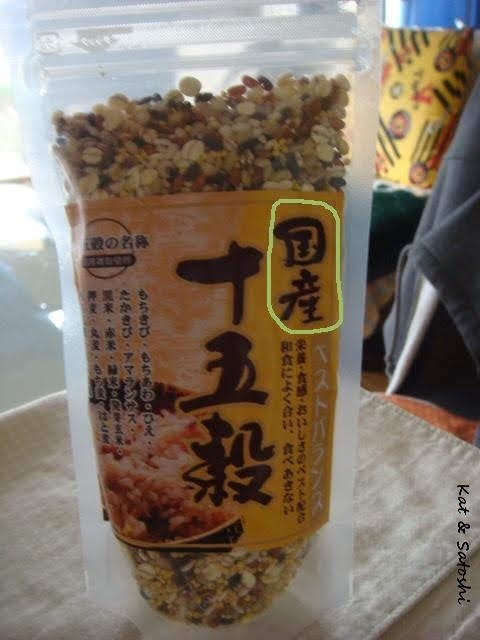 Because the noodle is flat, it is easy to eat when you dip it into the hot soup. 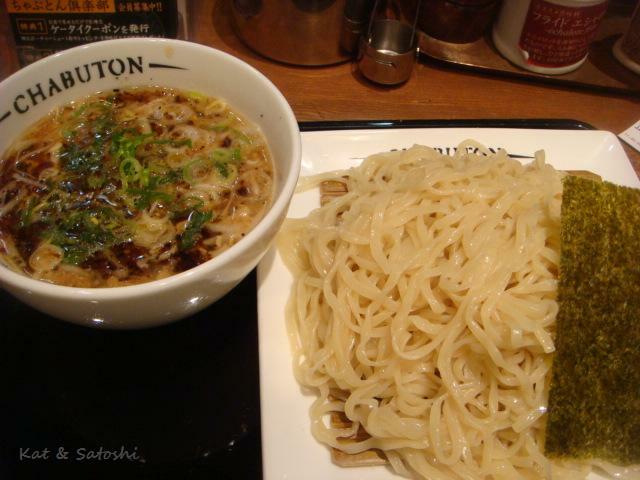 Satoshi chose the Chabuya-ryu shoyu ramen 680 yen (about US$6.80). This is the ramen version of what I chose. His noodles were flat too. 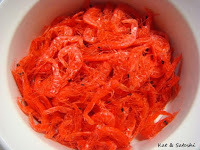 As part of the condiments on the table, there are fried eschalots, delicious when you sprinkle some onto your ramen, nice and crisp. 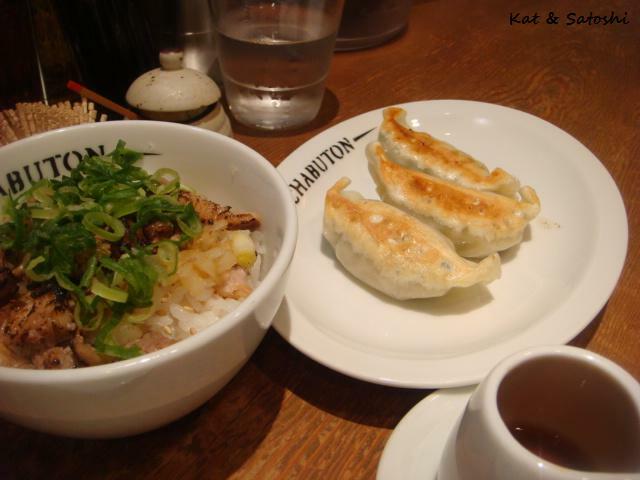 The gyoza here is made with ground chicken and shiso (perilla). Instead of eating it with shoyu and ra-yu (chili oil), you eat it with ponzu (citrus soy). The aburi roast char siu don is made from pork loin and grilled. It is chopped up and put over rice with green onions. I only tasted the gyoza from this and I liked the shiso flavor, delicious with the ponzu. The food here is delicious and very filling...we'll be back. So, after my failure with soramame, the first time, I finally found some at the market and decided to try them again. 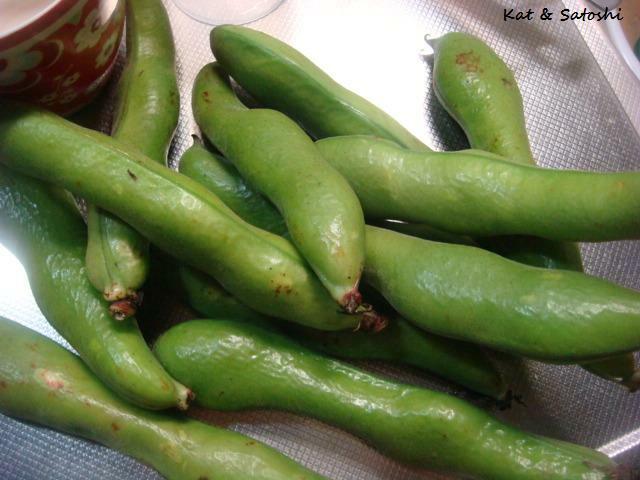 This time, I found 12 pods for 398 yen (about US$3.98), this gave me about 24 beans. I boiled them for the 2 minutes and stopped the cooking by putting them in cold water. 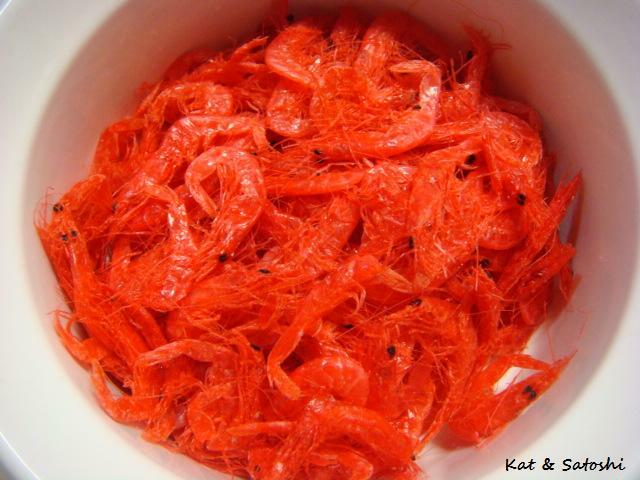 This particular shrimp is colored with an edible red dye, I was looking for the natural colored ones but couldn't find them at the market. So, after taking the beans out from the pot, I boiled my whole wheat pasta for a little under the time that was on the package. Then, in a frying pan, I heated some olive oil, and threw in some minced garlic. When I could smell the garlic, I added the shrimp to heat through. Then I added the pasta and some pasta water. I then added the fava beans and coated everything well. At the end I ground some pepper and served. 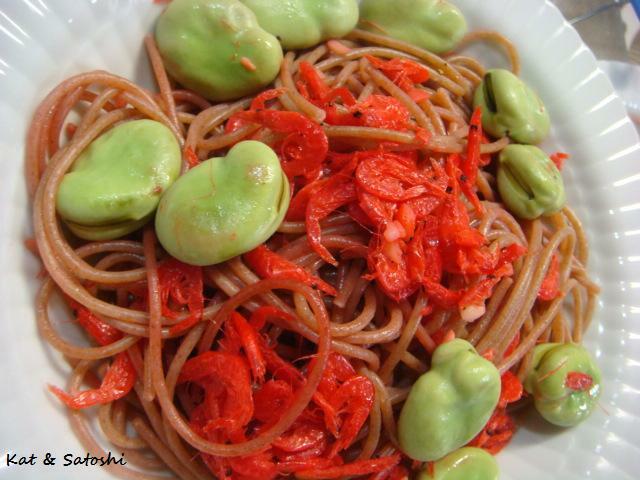 The bean skins were a little bitter, and the overall pasta was a bit on the dry side, I think I should have added a little more oil, but this dish was tasty. 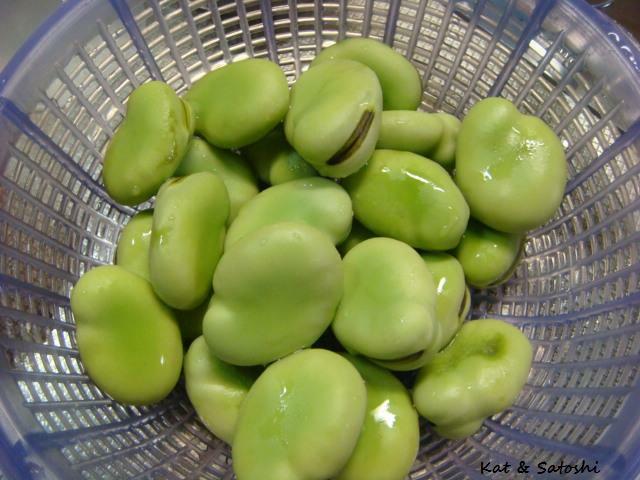 I think if I see these beans in the market again, I want to try roasting them. In advertising and marketing, the Japanese have a "code" for words which is called goro-awase. This is when they use the sound of numbers in Japanese to make words from them. You sometimes see this used in their phone numbers to make it easy to remember. It was also used for the naming of this tea. 728 is na-ni-wa which means the name of old Osaka. 143 is the urban language "code" for "I love you". 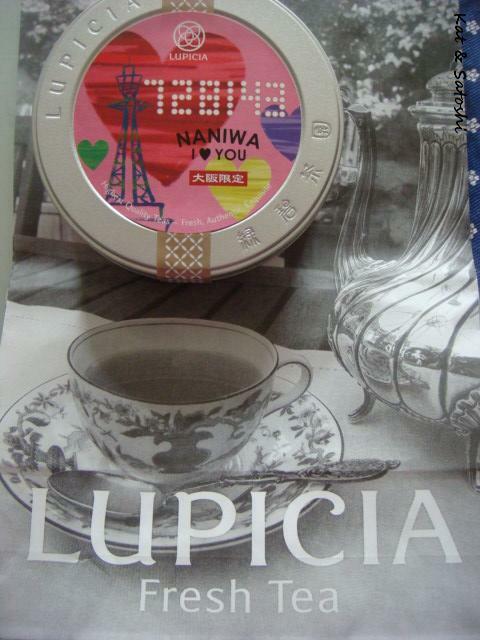 This particular tea made by Lupicia has apparently been on the market for sometime, I just discovered it recently. 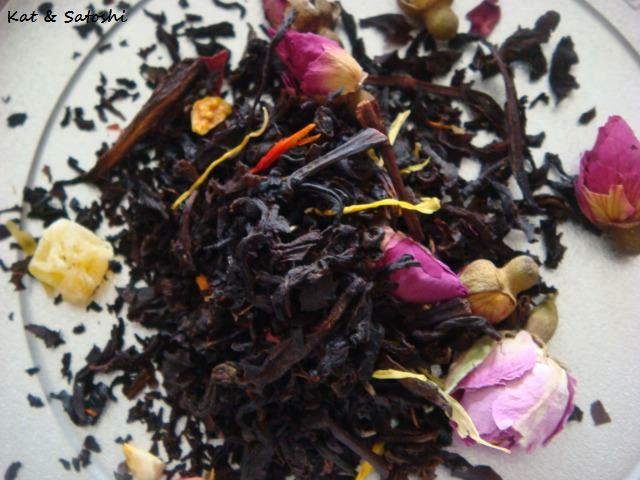 A black tea combined with mango & blood orange as well as some floral notes from tiny roses, give it a brightness which represents the liveliness of Osaka. This tea is delicious not too overpowering or fake flavored like some teas can be. It is great hot or iced. Friday has come so quickly, I hope your weekend will be a nice one!